Click to Join our Parish! We, the people of St. Aloysius Parish are united in one faith in Jesus Christ and His Church. We are proud to be Catholic and express this faith in the Roman Catholic tradition. As a local church, we encourage the people here to welcome those newly arriving to become a unified and loving family of Christians. We provide for the continuing educational and formational needs of our youth and adults. In this unity of faith, we desire to evangelize, to inspire lay leadership and to nurture a sense of ownership of mission and ministries that incorporate our multi-ethnic traditions. 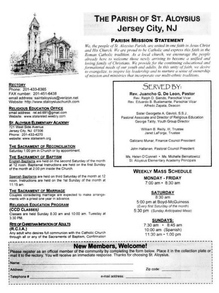 Holy Day Mass schedules are listed in the bulletin. Please click on the bulletin, above, to view it.